Are you looking for something different to cook for this Christmas? 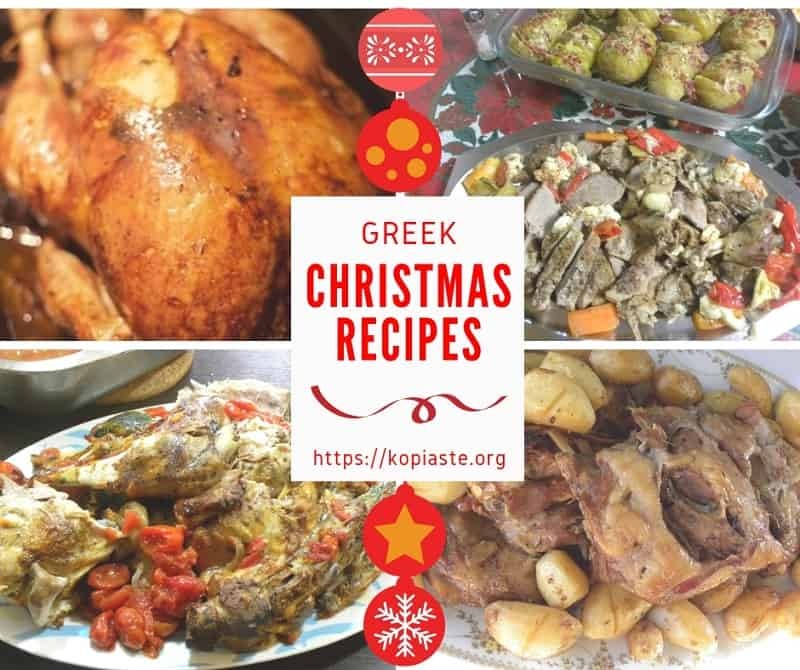 If so, I would like to share My Top Five Greek Christmas Recipes baked under an aluminum tent. Don’t panic when you hear aluminum tent, as I know that aluminum is not good for the health, but the meat is protected because there is parchment paper under the foil. An aluminum tent is placed on top in order to cover the baking tin so that meat can be cooked with steam until tender. I am sure many of you may have done this a thousand of times but I am sure that there are also many who have never tried this method or they may be doing it wrong. There are many Greek recipes where a “gastra” is needed. A gastra is a metal round container, which is the baking tin, with a second container, which is a bit bigger that covers the first container as a lid. This container was placed on a low tripod. They would then bake the food either in a wood-fired oven or in the fireplace, adding charcoal under the baking tin and on top of the lid. Modern cooking has replaced these gastras with Dutch ovens or even a regular baking tin which you can cover with an aluminum tent. Mine, although it is a Tupperware plastic one, it is heat resistant to 200C / 390F. However, it is not big enough to take a whole turkey, so in this case I use the large oven baking tin, where I add the aluminium tent on top. This way, the food will slowly cook the meat with steam, until tender. When the meat is cooked, the tent is then removed and the meat is baked until it becomes golden brown. I’ve been using this method for years, so I thought it would be best to create a video and a separate post to link to, instead of repeating the same thing over and over again. At the beginning when doing this, I would waste a lot of aluminum foil by wrapping it crosswise, to make sure that no steam would escape. Eventually, my husband and I found that this way was much easier and less aluminum foil is used. Just cut the foil about 1o cm bigger than your baking tin on each side. Then fold both pieces together twice. This way the foil will not open in the centre. I’ve used this method to bake Ofton Kleftiko, Agriogourouno sti Gastra (baked wild boar), Galopoula Gemisti (stuffed turkey), Gkioulpassi, Bogana (baked lamb with baby potatoes and tomatoes), etc. I hope you will find something that will make your Christmas dinner a little bit more exciting. Cut two large pieces of aluminum foil, around 62 cm long (My baking tin is 42 x 35 cm). Fold both pieces of one of the large sides 1/2 an inch (1.2 cm). Put the meat and the remaining ingredients in the baking tin. Cover it with parchment paper. Place the aluminium tent over the parchment paper with the seam facing down. Tuck the ends along the sides of the pan so that steam will not escape. Attention when removing the tent, as you may burn from the steam. When the meat is cooked, the tent is then removed. Continue cooking, until the meat turns golden browns. Cuisine: Greek Cuisine / Category: How to make..
It’s something like a cross between pork and beef. Thanks for this special recipe gift on Christmas; this will help me a lot. And inspire to create something new. Aah….got a lil late for christmas…this goes in for the weekend get together at my place. These recipes are so much helpful for me to prepare Christmas for my family. Keep it up! I’ve been to Greece twice and loved the food there. Was hoping to make some delicious things–I know it’s not Christmas, but I still want the Greek flavor. I’ve found my weekend recipes! Thanks! Lot of information about Greek food. Greek food is one of my favorite food. Greek Food is very good and delicious historically. Interesting old method of cooking. I would definitely try any of these dishes in my Dutch oven!